Primary cutaneous mucinous carcinoma (PCMC) is a rare skin cancer arising from sweat glands. According to available data, PCMC is extremely rare – fewer than 200 cases of PCMC have been reported in the literature. Although it is associated with good prognosis and low metastatic rate (10%), PCMC has a high rate of local recurrence (30%), and differential diagnosis can be problematic. Surgeons and pathologists should, therefore, be aware of its clinical and pathological features, which may easily be confused with those displayed by other benign or malignant lesions such as cystic lesions, sarcoma, and squamous or basal cell carcinoma. This means that the actual incidence of PCMC may be higher, and it is particularly important to exclude cutaneous metastasis from distant adenocarcinomas. The typical presentation site of PCMC is the head. 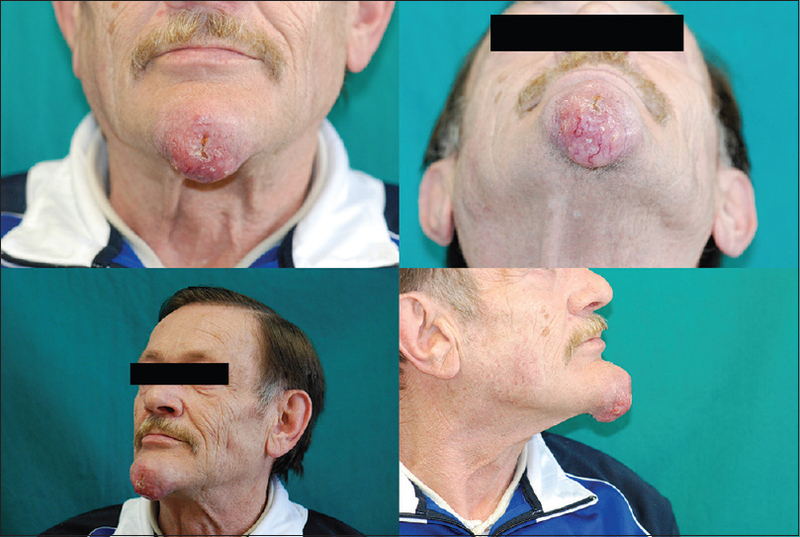 However, we present a very unusual case of PCMC of the chin  – a 62-year-old white male referred to our center for a prominent asymptomatic and slowly growing mass that had appeared on the chin 20 years before [Figure 1]. Examination revealed a mobile, firm, pink, telangiectatic, translucent nodule measuring 5 cm × 3 cm × 4.5 cm. Local lymph node examination was negative, and with the exception of a personal history of alcohol abuse and heavy smoking, the anamnesis was unremarkable. Dermatological examination of a biopsy specimen showed numerous islands of epithelial tumor cells “floating” in lakes of basophilic mucin. These cells presented few mitotic figures, round-to-cuboidal nuclei, prominent nucleoli, and abundant eosinophilic cytoplasm. Thin fibrous septa separated the large pools of mucin, forming a “honeycomb” pattern. Immunohistochemical profiling of tumor cells showed positivity for cytokeratin-7 (CK7), estrogen, and progesterone receptors; negativity for cytokeratin-20 (CK20), homeobox transcription factor (CDX2), and mucus-associated peptides of the thyroid transcription factor-1 and P63; and mucin positivity for alcian blue at pH 2.5 [Figure 2]. These features were characteristics of PCMC. p63 expression has been advocated as a valuable tool in distinguishing between primary cutaneous adnexal carcinoma and primary/metastatic visceral adenocarcinoma, the latter being usually negative for p63. As this case demonstrates, a panel of markers along with a complete clinical workup is essential to establish the diagnosis. PCMC can be distinguished from gastrointestinal tumors based on mucin histochemistry and immunohistochemistry: PCMC is CK7+ and CK20−, in contrast to gastrointestinal cancers, which show reversed positivity. Although more men than women are affected, a full clinical workup is essential to rule out cancers of a mammary or ovarian origin. The patient underwent radical excision of the tumor as the first-choice treatment for PCMC is surgery. Preoperative assessment – which included routine blood tests; electrocardiography; thoracic X-ray; and facial, abdominal, and pelvic computed tomography (CT) scans to exclude local invasion or distant metastases – showed no relevant findings. CT scan of the facial bones showed no signs of mandibular infiltration. Given the high recurrence rate, authors recommend considering >1 cm of healthy margins as safe although a systematic review and meta-analysis of 159 cases performed by Kamalpour et al. suggest that outcome after surgical excision depends on age, race, size, location of the tumor, and follow-up rather than on surgical margins. Although available reports indicate that margin size seems not to significantly influence the relapse rate, long-term follow-up data are scarce, and the excision was performed taking care to maintain a visible healthy margin of 2 cm, and reconstruction was delayed until histology confirmed clear >1 cm margins (2 cm from the superior margin, 1 cm from the inferior, 1.2 cm from the right, and 1.5 cm from the left). The residual defect, measuring 7.5 cm × 6.7 cm, was repaired with a bilateral advancement flap according to the Burow technique, which produced good esthetic outcome and patient satisfaction. Clinical examination of the patient was performed every 3 months, and no relapse occurred during 20 months of follow-up. In addition to the need for further and more recent follow-up data regarding previously reported cases of PCMC, this case highlights a requirement for PCMC to be considered in differential diagnosis of an indolent, asymptomatic, cutaneous, or subcutaneous neoformation of the neck, face, scalp, or eyelids. Total body scans are recommended to exclude primitive carcinoma or distant PCMC metastases. Scholz IM, Hartschuh W. Primary mucinous eccrine carcinoma of the skin – A rare clinical tumor with many differential diagnoses. J Dtsch Dermatol Ges 2010;8:446-8. Breiting L, Christensen L, Dahlstrøm K, Breiting V, Winther JF. Primary mucinous carcinoma of the skin: A population-based study. Int J Dermatol 2008;47:242-5. Wright JD, Font RL. Mucinous sweat gland adenocarcinoma of eyelid: A clinicopathologic study of 21 cases with histochemical and electron microscopic observations. Cancer 1979;44:1757-68. Kanitakis J, Chouvet B. The usefulness of P63 detection for differentiating primary from metastatic skin adenocarcinomas. J Cutan Pathol 2008;35:692-3. Wick MR. Primary lesions that may imitate metastatic tumors histologically: A selective review. Semin Diagn Pathol 2018;35:123-42. Kamalpour L, Brindise RT, Nodzenski M, Bach DQ, Veledar E, Alam M, et al. Primary cutaneous mucinous carcinoma: A systematic review and meta-analysis of outcomes after surgery. JAMA Dermatol 2014;150:380-4.